Mangaluru, Oct 12, 2016: Soon, the ‘bullet tankers’ would be a thing of the past on the Mangaluru-Bengaluru National Highway (NH 75) as the Hindustan Petroleum Corporation Ltd., (HPCL) is geared up to commission the Mangaluru-Hassan-Yediyur/Mysuru LPG pipeline. Originally envisaged to be till Solur near Bengaluru, the pipeline now terminates at Yediyur. Line has been laid for the entire 355.22 km length, including Hassan-Mysuru and it has passed the mandatory inspection by the Oil Industry Safety Directorate. Charging of the pipeline will commence on October 15 and full flow is expected by month-end, said highly placed sources in public sector oil companies. Sources told The Hindu that testing is being done at present by pumping water which would be followed by charging the line with LPG. About 150 tonnes of LPG could be pumped in an hour, equivalent to the capacity of nine bullet tankers. 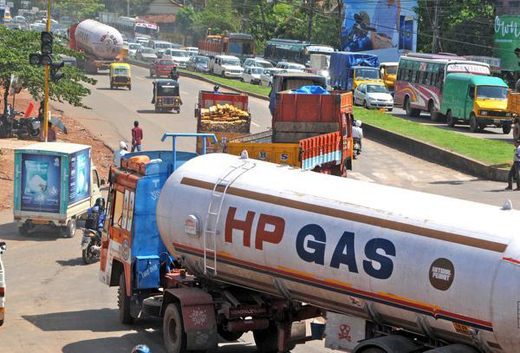 About 175 bullet tankers move from HPCL’s LPG Import Facility at Mangaluru towards Bengaluru/ Mysuru and another about 80 towards Karwar/ Kerala every day. Ashok, Assistant Commissioner of Mangaluru Revenue Sub-Division, who is the competent authority for the project, confirmed to The Hindu that the pipeline is ready for commissioning. HPCL has also given tentative dates of commissioning to the district administration, he said. Sources said the company has already commenced patrolling of the entire pipeline network. Besides manual patrolling, the Supervisory Control and Data Acquisition (SCADA)-enabled remote control system would monitor the pipeline round-the-clock. The chances of LPG pilferage are highly remote as its storage is not easy. The line lies 1.5 m below the earth surface and goes up to 6 m depth at river-beds and roads. HPCL will undertake bottling of LPG at its Yediyur plant, about 60 km from Bengaluru. The company has put up a tanker-loading facility as well as LPG bottling facility at Yediyur for the onward movement of LPG to Bengaluru and surrounding areas, including border areas of Tamil Nadu and Andhra Pradesh. The two other PSUs, Indian Oil Corporation Ltd, and Bharat Petroleum Corporation Ltd., might deploy bullet tankers to transport LPG to their bottling plants and other places. BPCL appears not keen on taking the line from Yediyur to Solur since the volumes are not high and would instead use bullet tankers, sources added. The pipe lines are very important because there are so many tanker accidents these days.